This week, when unwrapping your lovely new edition of The Biologist, you might notice a slight difference: the clear protective polythene wrap has been replaced with a milky, biodegradable envelope. This fully compostable biopolymer, known as Mater-Bi, is composed of natural corn starch and vegetable oils. We will no longer use polythene, which is only sporadically recycled by UK councils. Scientists and campaigners alike have been sounding their trumpets for aeons; and it seems awareness and action around the severity of the plastic pollution problem is finally gaining momentum. Consumer behaviours surrounding the use of plastics are already changing, and Governments and corporations are responding. Around 70 major businesses have signed up to The UK Plastics Pact, a collaborative initiative with the aim to develop a circular economy for plastics. The incentive will ensure that more packaging can be reused, recycled, or composted. Such a scheme would see a reduction in single use plastics primarily made to throwaway – a culture that requires a substantial overhaul. This programme fits well into the ambitions of the 25 Year Environment Plan, the UK Government strategy to leave the environment in a better state than inherited. Progress towards this goal is already underway: with plans in place for a ban on the sale of microbeads to take effect in July, and a ban on plastic straws and cotton buds under consideration alongside community consultation to address single use plastic waste and a deposit return scheme to increase recycling rates. As of 4th June, the Scottish Government is banning single-use coffee cups from its main buildings, preventing approximately 450,000 cups being thrown away per year. Internationally, the European Commission has recently published regulations to reduce single-use plastic products. The UK is also spearheading international efforts, having announced that a fund of £61.4 million will support the Commonwealth Clean Oceans Alliance in its goal to achieve UN Sustainable Development Goal 14, which includes the pledge to end the use of single use plastic. Under favourable conditions, all plastics are biodegradable through the enzymatic activity of microorganisms, though this can take hundreds of years. ‘Degradable’ items break down into smaller pieces, including microplastics (less than 5 millimetres), which are known to have detrimental impacts on marine and land-based ecosystems. ‘Compostable’ plastics include those that break down by 90 percent within six months. ‘Biodegradable’ items break down fully into carbon dioxide, water and biomass. A newly identified bacterial enzyme has the capability to speed this process and there are hopes it could be developed to quickly and efficiently aid biorecycling. Ideonella sakaiensis 201-F6 is capable of digesting polyethylene terephthalate (PET), used in plastic drinks bottles. It secretes the enzyme “PETase” which breaks down larger molecules (esters) into smaller ones which can then be absorbed by the bacteria and used as a food source. While these developments are positive, efforts to reduce the use of plastic and the waste this generates are arguably only part of the solution. 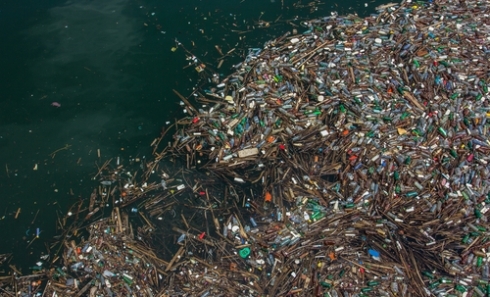 Plastics have transformed and are fundamentally ingrained in our day-to-day lives. More alternative materials with equivalent properties are needed. For example, a process has recently been developed to turn fungal mycelium into packaging as a replacement for polystyrene. Further substitutes include more easily recyclable options such as glass, or new takes on traditional materials, such as liquid wood. The idea that there could eventually be more plastic than fish in the sea is a scary concept, and we collectively have a lot of work to do. However there is hope, with incremental changes starting to be seen in Government, industry and consumer behaviour. We need to kick our plastic habit, and fast, and RSB is pleased to be playing its part.